mc-mommyland!! : Here I am, thanks to Legolas! Celebrating the daily adventures in my crazy world with my family! Here I am, thanks to Legolas! Who? What? Well, Legolas is my cat. He is a sweet cat that is all white and he is sweet, did I mention he is sweet? This is important, because if he weren't sweet? Dude would be out the door and I mean yesterday! Patty, you ask, what the hell are you talking about? Well this wonderful furball has recently decided that, like dogs do for their owners (I hear, my dogs don't actually do this though!) he MUST wake me up at 5:30 in the morning, if by chance I am not already up!!! Normally, this wouldn't be an issue because the babies are ALWAYS up like friggin clockwork! But today? Well let's just say Lego is on my list, and it ain't the good one! It is now 7:34, I have been up (thank you, Mr. Meows so loudly his cuteness/sweetness is only going to get him so far, cat!) since 5:30. But the babies? STILL SLEEPING, as SHOULD I be! The only bright side is that here I sit and I can fill you in on the going's on in mc-mommyland! Poor little Mia got sick on Monday night. By Tuesday night I knew I was likely looking at the possibility of missing work the next day as daycares aren't exactly warm to the idea of sick kids being left there. Luckily, I have a great boss who is understanding and I stayed home on Wednesday to tend to my 20lb wonder (my little nickname for the girl who won't gain weight! It took her until 24 months of age to hit the 20lb mark and she just can't seem to get any heavier! The underweight issue, she totally gets it from me.....NOT!). Anyways, nothing like waiting to call the Dr. because your little on is VERY sick (coughing, fever, sullen face gives her away) and then getting a text from a bitchy coworker who is pissed because she is now forced to make 1 retainer... REALLY? But that is a whole 'nother story! Ok, to my point, she got to see HER Dr (which always reassures me because Dr. Irwin is the bestest Pediatrician in the whole entire world!) and we found out the poor baby has pneumonia!!! Holy cough Batman, pneumonia?! That wasn't something I expected, sooo very happy I got her in NOW and before it got WORSE! Little princess really has suffered enough in her short life w/ her acid reflux and hernia she had as an infant, poor baby! So, out came the baby monitors again (thank God I still have them!) as I was freaking out that she would struggle to breath while sleeping and how would I know??? She is doing better now. Still has the terrible cough, but fever free since starting the antibiotics so hopefully it will be gone soon! Well, pretty sure AJ is coming down with something as he keeps saying he feels sicky and is more whiny then a cold cellar in Napa Valley! Yep, something probably brewing! Ashlynn? Ya, sure, you betcha, she seems to think she is sick too. It has seemed as though she was trying to cough like Mia, but maybe there is really something there too? Ay Dios mio, what's a mc-mommy to do??? So, this message has been brought to you because of a noisy, naughty kitty! I guess I should say thank you to Legolas, but that is not exactly how I am feeling right now! Mia is up now, so gotta go! Little peanuts are the best! :) I don't think mine is as small as yours, but she is tiny none the less. I hope they aren't alllll sick, and I hope your daughter feels all better soon. (I stumbled over here from the spohrs site). Have a nice day! Feel free to leave me comments! I am always interested in what you have to say, unless I don't agree with it of course!!! I read all emails I receive and will reply as quickly as possible, thanks! I am a mother of 3 children, wife to the love of my life, my high school sweetheart whom I started dating when I was 14! I have worked in orthodontics for more years then I want to admit to! I am a student, a follower of Christ, a wannabe singer, an avid reader, etc, etc, etc. My interests are all over the place, as are my moods at times! This blog is about me, my family, and whatever I feel like writing about! Sign up for e-mail updates to my blog! A contact form is posted at the bottom of this page. Feel free to contact me. I appreciate and read all comments left on each posting as well as any emails I receive! Thanks for stopping by!! 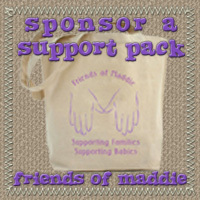 Become a Friend of Maddie!! 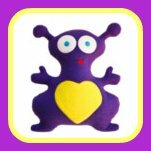 Help families in Maddie's name!